“No English,” a wide-eyed Ocasio-Cortez told reporters who asked why the FAQ appeared and why it was removed from her website. Go here to read the rest. I confess that the Green New Deal FAQ, go here to read it thanks to the internet being forever, probably does make more sense if written in gibberish. The problem isn’t that AOC is an idiot. That and dishonesty are universal traits of politicians. The problem is there are millions of voters that are even more stupid. Figuratively grab the imbeciles by their noses and kick them in their behinds. That was amusing hearing the Bombard’s body language commentary on the professor’s replies to Carlson’s questioning. Sad thing is Bombard Body Language isn’t available every time a stupid or lying or stupid and lying Democrat opens their mouths. A billion trillion here, a billion trillion there, pretty soon you’re talking real money! Remember when the only people who counted in trillions were astronomers and astrophysicists? 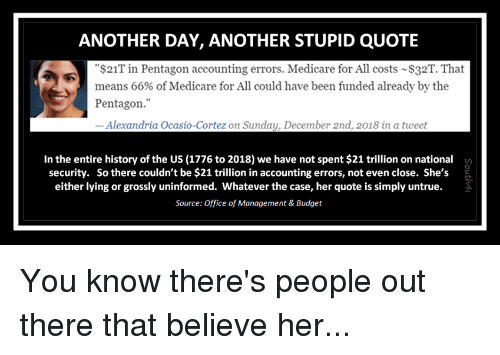 One could publish a desk calender with AOC’s quote of the day. Guarranted to be a best seller. Her fan club wouldn’t realize it was it was a farce. Amusement for some, a bible for Socialist true believers.